Don’t know if you should go for Double Cleanse? Beauty with Charm tells you all you need to know! 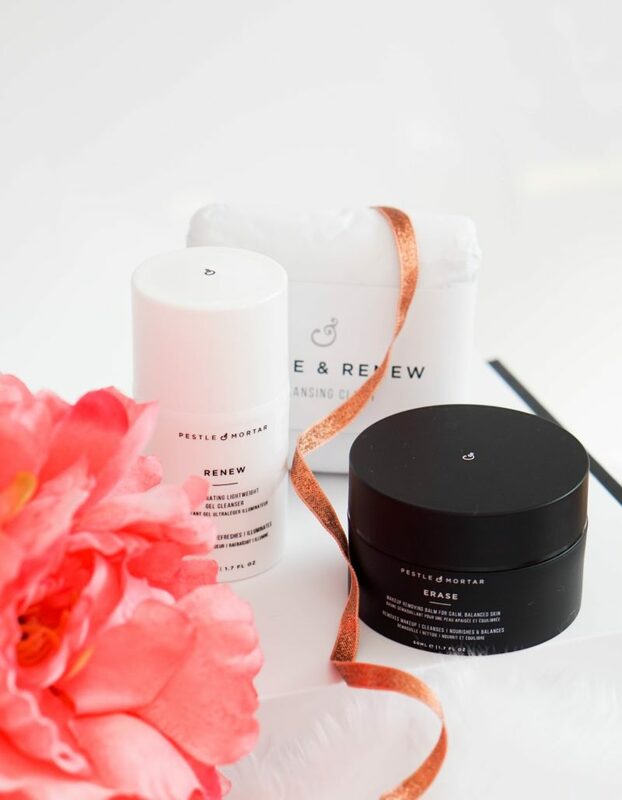 Here’s a brand that I love, Pestle & Mortar as I am trying out their newest product release… The Erase & Renew Double Cleansing System. Double Cleanse with Erase & Renew! Double cleansing your skin is all the rave at the moment and whilst it’s not something that I use daily, I do agree that it’s worth taking the extra steps in your skincare routine when you can. Erase – a makeup removing balm, Renew – an illuminating lightweight gel cleanser, along with a double cleanse facial cloth. When my skin is feeling a bit dry and looks dull, I always find this technique of double cleansing super effective! Not only are you removing makeup, but you are also removing impurities and dead skin cells, in a gentle way. The first step here is the Erase Makeup Removing Balm, which is a solid that should be warmed up in the palm of your hands and massaged into the skin. It helps to break down makeup, even stubborn eye makeup (not that I like the whole panda eye look). The balm is a nourishing blend of cold pressed grape seed oil, pumpkin enzymes and prickly pear seed oil to promote cell renewal, retain moisture and fight free radicals. This should be removed with the exfoliating muslin side of the face cloth included. Then you can move on to step two, which is the Renew Illuminating Lightweight Gel Cleanser. Formulated with meadowfoam seed oil, papaya and mango enzymes, to improve skin texture and tighten pores. This lightweight cleansing gel leaves skin feeling brighter, more hydrated and glowing overall. This is again removed with the face cloth included, but this time you are using the smoother cotton side. I am loving how soft my skin feels and how radiant it looks when I take the extra time in my routine to use this double cleansing system. This entry was posted by admin-dc in Uncategorized. ← Really Ree Reeeeeally Loves to Double Cleanse with Erase & Renew! Get updates from Pestle & Mortar.